I have no shortage of photos! In recounting some of my past projects I had the idea that it would be fun to create small photo collages to highlight the unique look of some of my older work. For the most part a lot of these photos have sat on CD or in a folder where they're just not seen. Once again, the blog seems to be the perfect venue for quick reference and a bit of nostalgia. Expect to see more of these as I work my way through my archives. Check out the complete Educated Detours project by clicking here, and have a look at the short trailer below. Reminds me of the trek I took last weekend. 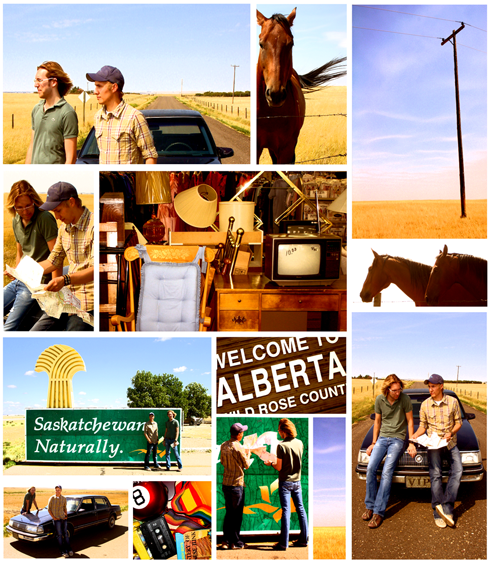 Your collage makes the trip between Alberta + Saskatchewan even look cool! Ya, the project was kind of my ode to the stereotypical prairies.